Irish lottery is the multimillionaire creator lotto which having minimum jackpot of worth €2 millions and because of rollovers it rises up quickly. It is also popular choice among the people who enjoys the betting on lotteries, with many bookies offering odds on Irish Lotto markets. You will get here the answers of the various questions in your mind keep reading below. How to play Irish Lottery? For validates your winning you have to choose six numbers from 1 to 47. Who will match all the six numbers with the draw of that night will win the lottery jackpot. Also the bonus ball is drawn from same machine after six main numbers and this bonus ball offers you the additional price when it match with two, three, four or five main numbers. The details of odds of receiving prize and the amount you can win is shown below in the table. You can play the Irish lottery through the online ticket page even you live wherever in the world. For this simply you need to choose the those you wish to play on. Otherwise you will have quick pick option too which aromatically selects the numbers for you. 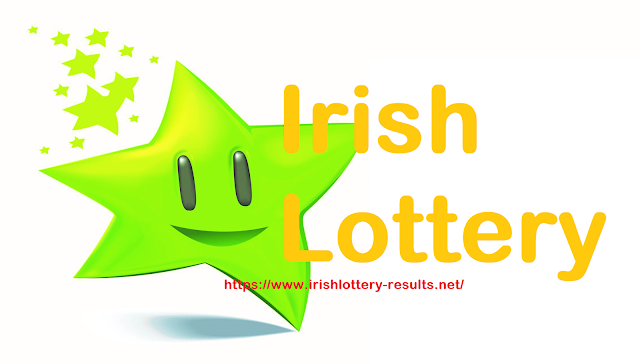 Playing online lottery is safe than the traditional method because you don’t need you worry about the loosing tickets and also if you won the draw you will get informed by the mail so that is reduced the chances of missing out the winning amount of Irish Lottery. This is the conventional method of playing the lottery game. For this simply you need to go to the any one of 3700 Authorised Retailer stores over the Ireland and simply fill in the play slip with the six numbers you want or you can ask to staff for Quick Pick. It is advisable to sign on the back of the physical ticket so that it will be the proof of your ownership of the ticket. 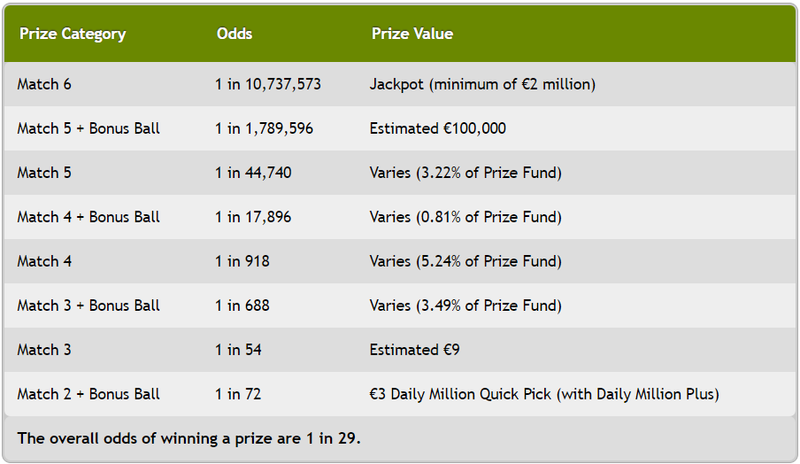 Irish lotto minimum jackpot starts with €2 million and grows so quickly after the rolls over. Most of the time the jackpot pass over the €5 million. You need to match all your six numbers with the draw and you win the jackpot prize of the Irish Lotto. If you compare this with the other major lotteries in the world you will found that Irish lotto is the most favourable odd of winning the top prize. Apart from this their is their is reserve prize fund this fund is came from the remaining 15.8% of the remaining prize. This fund can be used for any prize tire in given game. You can increase the chances of winning prizes by playing Plus 1, Plus 2 and the Plus Raffle. You can find out more about Plus 1, Plus 2 and the Plus Raffle on link given below. On 28th June 2008 a group of 16 quarry workers in Bennekerry, Co Carlow claimed the biggest Jackpot of the Irish lotto till the date. This jackpot is worth of €18.9 millions, which was worked out at around €1.2 million each! For the fans of Irish lotto their is an alternate way to win the great prizes which is to do Irish lotto Betting. Even if you are betting you can still choose your own numbers if you want. This service is also available online so your bet is secure and you will be automatically informed of any win. Doing the bet on Irish Lotto is so simple and quick. All you have to do is decide how you wish to pick your numbers and the amount of bets you wish to make, then wait for the draw to see if you are a winner. For prize €15,000 and more- Paid by the cheque at the lottery headquarters in Dublin. After 90 days of Irish lottery results, an unclaimed prizes are returned to the Irish National Lottery. This amount is used to promote the game, which boosts funding for good causes. If you are a winner of Irish Lotto's online betting service, then the claiming of the winning amount is depends on which site you used for betting. Checkout the payment policy of the site you use.